Beautifully engraved RARE certificate from the Peet Bros. Manufacturing Company issued in 1913. This historic document was printed by the Union Banknote Company and has an ornate border around it. This item is hand signed by the Company’s Founder and President, William Peet and its Secretary, Albert William Peet. This item is over 102 years old. Peet Brothers was a Kansas based soap manufacturer that was founded in 1872. Their products included Crystal White Laundry Soap, Crystal White Soap Flakes, Creme Oil Toilet Soap, Imperial Peroxide Toilet Soap, Sea Foam Naphtha Washing Powder, Borax Washing Compound, and many others. The company's main plant was located in Kansas City. In 1864, Caleb Johnson founded a soap company called B.J. Johnson Soap Co., in Milwaukee. In 1898, this company introduced a soap made of palm and olive oils, called Palmolive. It was so successful that that the B.J. Johnson Soap Co. changed their name to Palmolive in 1917. In 1927, Palmolive merged with Peet Brothers to became Palmolive Peet. In 1926, soap manufacturers Palmolive and Peet merge to become Palmolive-Peet Company. 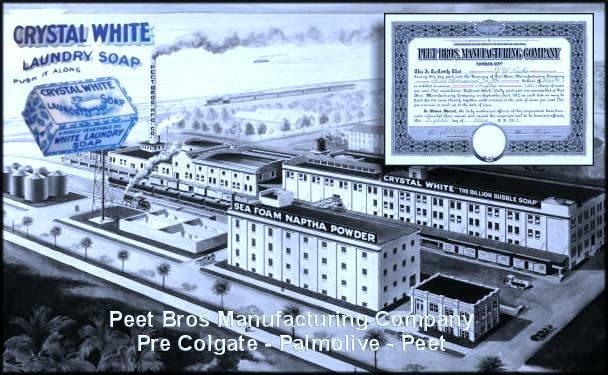 In 1928, Colgate merged with Palmolive-Peet to become Colgate-Palmolive-Peet Company. In 1953, the Colgate-Palmolive-Peet Company name was simplified to Colgate-Palmolive. In 1872, when the three Peet brothers came to Kansas City from Cleveland, Ohio, in search of their fortune, they found a very small but thriving village, which seemed to them had possibilities for large development. These young men had a total capital of eight hundred dollars, with which they determined to engage in the soap manufacturing business. They located a small frame building on the banks of the Missouri River, which then formed the principal means of commercial contact with the East, and in this room they established their factory and office. There were no employees, all of the buying, manufacturing, selling and collecting was done by the three brothers. They manufactured their product in an iron kettle which had a capacity of about ten thousand pounds, and the soap was stirred by hand and cooked over a stove. In contrast to this, the Peet Brother's Kansas City factory of today operates twenty-six kettles, each having a capacity of four hundred thousand pounds, and each kettle extending from the basement to the third floor of one of the factory buildings. In 1890 the firm built what was then considered quite a modern soap factory in Kansas City and gradually extended their field of operations so as to absorb their total production of some two thousand cases of soap per day. In those days brown or yellow soap predominated all over the country, and this was made entirely from animal fats and rosin, the latter accounting for the color of the soap. In 1897 Peet Brothers Company conceived the idea of manufacturing a white laundry soap which would contain no animal fats, and instead only vegetable oils, consisting the most part of cotton seed oil and cocoanut oil. The firm did not have sufficient capital to advertise the product; they placed one bar of Crystal White in each box of one hundred bars of yellow soap which was shipped to their trade. In the course of time the objections to this became so few that the company started placing two bars of Crystal White in each box; gradually the amount was increased until there had been created a sufficient demand for this new white soap to justify marketing it under its own name. This soap was in a large measure responsible for the success of Peet Brothers, and the demand for Crystal White has grown from year to year until now it requires two large factories, with a capacity of nearly two million bars per day, to supply their customers. In 1910 the firm's only factory, located in Kansas City, burned to the ground with an enormous loss, which wiped out the entire surplus of the company which had been accumulated over a period of thirty-eight years. A still greater loss faced the company in that they apparently would be unable to keep their brands, on which hundreds of thousands of dollars had been expended for advertising, on the market; also because of the probability of losing their organization. It was characteristic of Mr. William Peet that a tract of ground for a new factory was purchased before the embers in the old building had become cold, and plans were made for building a new and larger factory immediately. Also, it was arranged to keep the entire selling organization by paying them a substantial part of their salary, even while idle. The first year of operation in the new factory produced a larger volume of business than had ever been done before. In 1916 the company built a large modern soap factory in Berkeley, California, to take care of the business which had been developed west of the Rocky Mountains, and this factory has been running to capacity ever since the first day it opened and there have been several additions made which has greatly increased their production capacity. Through this factory a large export business has been developed. While the company had been engaged in the toilet soap business for a good many years in a modest way, no great progress had been made in this particular line until 1915, when Creme Oil Toilet Soap was placed upon the market. This brand was manufactured from olive, cocoanut and palm kernel oils, and has now developed into one of the largest selling brands of toilet soap in this country. The resources of the world are drawn upon to supply the requirements of the Peet Brothers Company, cocoanut oil, for instance, being imported from the Philippine Islands, India and Java and other South Sea islands. Olive oil is received from Spain and Italy, palm kernel oil from remote Africa and cotton seed oil from the mills of Oklahoma, Texas, Arkansas and other cotton-raising States. 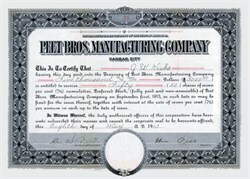 Mr. William Peet, the only surviving member of the original partnership, is now inactive, and the business has been managed for the last ten years by his son, Mr. Albert W. Peet, who has displayed all the business acumen of his father, and under whose leadership the business has grown and prospered more rapidly than at any time in the history of the company. Soap manufacturers. This firm consists of Robert and William Peet, and J. W. White. Robert and William are natives of England. They were born near Cambridge, in Cambridgshire, and are now aged respectively, 33 and 37 years. They spent their boyhood days on a farm, coming to America when boys of 15 and 19, spending all they had in defraying the expense of their voyage. They began life in a strange land, empty-handed. First found employment in the soap manufactory of Joseph Stafford, in Cleveland, Ohio, where the elder brother worked five years, learning the business, while his brother, after one year, quit and learned the carpenter's trade. The elder Peet, after working at the soap business for eight years, had accumulated the sum of $500, and was contemplating a visit to his old home in England, when he was advised by friends to abandon it, and come to Kansas City, well knowing that he was well versed in the secrets of manufacturing soap. After consulting his brother, who then resided at Cleveland, Ohio, he started for the west, coming to Kansas City in 1872, where he quickly discerned the advantages of the place and telegraphed his brother, who came at once. They first rented the old deserted soap factory belonging to Iven Brothers for one year, but occupied it only ten months, when Gen. W. H. Powell became connected with them. They being very young, and with limited capital, the accession of General Powell gave the business a new impetus, and, requiring larger quarters, they removed to No. 4, East Levee, near where they now are. In 1873, Gen. Powell sold is interest to Capt. J. W. White, when the present firm of Peet Brothers & Co. was organized. They have been successful from the first, and their business so increased that they had to enlarge their quarters by renting different buildings. Now they own the extensive soap works, formerly the old Kearney warehouse, on the levee, at the foot of Delaware street, a building 25x100 feet and three stories high, to which they are putting up an addition, 25x100 feet, with a basement and two stories high. They manufacture 3,000 boxes of soap monthly, which is sent throughout Missouri, Kansas, Nebraska, Colorado, Texas and New Mexico. Mr. White was born near New Bedford, Mass., August 6, 1821, and when sixteen years of age went on board the old Minerva, and followed the sea thereafter for twenty years, serving from a common sailor up to master of a vessel, and has been in most of the important ports of the world. He has made three whaling voyages in the Arctic regions, being at one time master of the Nasson, and afterwards the William Thompson, taking from two to three years to make the voyage. He abandoned the sea in 1857, and lived in Illinois until 1866, when he went to Cleveland, Ohio, and engaged in the implement business. Leaving there in 1873, he came to Kansas City and became connected with the Peet Brothers.